With 2014’s Edge of Tomorrow, we see the impact non-American grosses make in the movie business. If we view the film’s US performance, it comes across as a massive disappointment; with a budget of $178 million, the Tom Cruise “summer tent pole” flick barely mustered $100 million in the States. As of late September, that’s only good enough for 22nd place at the box office, a ranking sure to plummet by year’s end. However, when we take in the bigger picture, the film’s fate doesn’t look so bad. Edge snared $269 million outside of the US, so its final total of $369 million doesn’t dazzle but at least it gives the movie a more respectable fate. Though not the fate it deserves, as the clever, exciting Edge should’ve been one of the summer’s big hits. Set in the near future, aliens called “Mimics” attack Earth and seem to be unbeatable. Eventually the humans create a mechanical suit that allows their users to become “super soldiers” and this leads to the first victory against the invaders. Major William Cage (Cruise) acts as a military spokesman and finds himself in an unexpected predicament when General Brigham (Brendan Gleeson) sends Cage to sell “Operation Downfall” to the masses. The cowardly Cage prefers an assignment far from the frontlines and resists these orders, a decision that backfires. Cage ends up busted in rank and assigned to be trained by rough-edged Master Sgt. Farell (Bill Paxton). With minimal experience, Cage enters combat as a panicky mess who dies not long after the start of battle - or so it seems. Despite Cage’s apparent demise at the tentacles of the Mimics, he wakes up right back where he started the prior day. This sets Cage on an improbable journey, as he discovers that whenever he gets killed, he “resets” and needs to repeat events that start when he meets Sgt. Farell. Cage struggles to make meaning of this and learns how to use this odd “gift” with the help of Rita Vrataski (Emily Blunt), then “super-soldier” who did the most to carry the victory at Verdun. Detractors like to refer to Edge as a sci-fi Groundhog Day. While I understand those comparisons, they tend to make Edge seem more derivative and less creative than it is. Once we get past the superficial “same day repeated endlessly” connections, Edge offers plenty of its own personality. Clever, smart and fun, Edge tells its narrative in a fairly logical way and doesn't spoonfeed the audience. It drops hints and clues but doesn't shove tons of exposition down our throats, which I appreciate. I don't think the story ever really grinds to a halt so Morris the Explainer can appear, and that's no mean feat given the complexity of the story. It becomes fun to see Cruise alter his standard "true blue hero" template and play a coward for once. Of course, this changes as the movie progresses, but I like the way it makes him out to be such a weasel at the start. This allows Cruise to show more range than usual, as Cage displays more growth than one expects from the actor’s roles. Cruise fills out the part in a satisfying manner. Edge doesn’t mark Blunt’s first action movie, but it gives us our first glimpse of her as an action hero. She doesn’t seem especially natural in the part, but she adds layers to the thinly-written character and works out well. Speaking of action, director Doug Liman started in comedy but morphed into the genre over the years. He appears at home with Edge, though it provides a more obvious effects-based film than his prior works. Liman stages matters in a strong manner, from the sci-fi Saving Private Ryan beach battle to other action scenes. Liman throws good set pieces at us and also keeps the potentially confusing story grounded. Of course, Edge comes with some plot holes - those become inevitable in a story of this sort - and I can’t say I’m wild about the finale, but overall, I think it gives us a smart, exciting and consistently compelling flick. 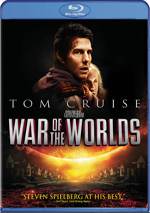 Edge of Tomorrow appears in an aspect ratio of approximately 2.40:1 on this Blu-ray Disc. I expected a brand-new big-budget flick like this to look great, and Edge did. Overall definition worked well. Some effects shots could be a little soft, but those instances were infrequent and minor. The vast majority of the flick offered tight, accurate delineation. I saw no shimmering or jagged edges, and the image lacked edge haloes or print flaws. Like many modern action flicks, Edge opted for a fairly teal palette; it also leaned toward an amber tone at times. I would’ve liked something that deviated from the norm, but within its parameters, the hues seemed positive. Blacks were deep and dark, while shadows showed nice clarity and smoothness. Across the board, the movie looked terrific. I also felt consistently pleased with the excellent DTS-HD MA 7.1 soundtrack of Edge. With tons of action, the soundscape used all the channels on a frequent basis. This led us to an exciting sonic experience from start to finish. Under Operation Downfall, we find two components: “Operation Downfall – Adrenaline Cut” (2:34) and “Storming the Beach” (8:59). “Adrenaline” just shows a scene from the movie; without directly comparing it to that sequence, I can’t tell if any differences occur, but I see no obvious changes, so I don’t know what point it serves. 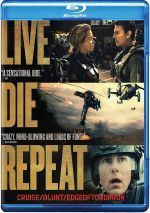 A more traditional featurette, “Beach” provides notes from director Doug Liman, producers Erwin Stoff and Jeffrey Silver, production designer Oliver Scholl, stunt coordinator/2nd unit director Simon Crane, visual effects supervisor Nick Davis, and actors Tom Cruise, Emily Blunt and Bill Paxton. The piece examines various issues related to the creation and shooting of the movie’s major battle sequence. It’s a short but satisfying take on the topics. During the eight-minute, 25-second Weapons of the Future, we hear from Cruise, Blunt, Liman, Paxton, Scholl, Crane, Silver, and exo-suit designer Pierre Bohanna. “Future” examines the design and execution of the various military elements seen in the film. It gives us a useful enough examination of these areas. Next comes Creatures Not of This World. The five-minute, 38-second short involves Liman, Stoff, Scholl, Cruise, Davis, Silver, Crane, and Blunt. Here we learn about the design of the Mimics and the effects used to bring them to life. Like its predecessors, “World” lacks great depth but it tosses in some good information. On the Edge with Doug Liman fills 42 minutes, 37 seconds and delivers notes from Liman, Cruise, Crane, Scholl, Blunt, Silver, Stoff, Bohanna, Paxton, Stoff, Davis, costume designer Kate Hawley, Liman’s assistant Dan Lyons, script supervisor Lisa Vick, and actors Tony Way, Jonas Armstrong, Charlotte Riley, Franz Drameh and Kick Gurry. While it offers a general focus on Liman’s work, “Edge” tends to become a general overview of the production. This means we find a mix of subjects like cast and performances, sets and locations, design and effects, stunts, and related subjects. Similar to the other programs, “Edge” can be more than a little fluffy, but it provides a nice range of details as well as plenty of good footage from the shoot. These factors allow “Edge” to turn into the disc’s best piece. Finally, we get seven Deleted Scenes. These fill seven minutes, 38 seconds and mostly give us extensions to existing sequences. We see more of how Cage adapts to his military gig as well as additional interactions with Rita and the other soldiers. None of these provide anything memorable, but they’re enjoyable to see. The disc opens with ads for Mad Max: Fury Road and The Hobbit: The Battle of the Five Armies. No trailer for Edge appears here. A third disc brings us a DVD copy of Edge. It includes the Weapons and Creatures featurettes but lacks any of the other extras. Edge of Tomorrow gives us a clever sci-fi plot and turns into a lively, exciting action flick. Despite a number of potential pitfalls, it keeps us engaged and entertained. 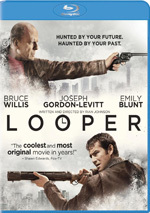 The Blu-ray delivers excellent picture and audio as well as a decent array of supplements. A winner from start to finish, Edge ended up as my favorite summer 2014 movie.